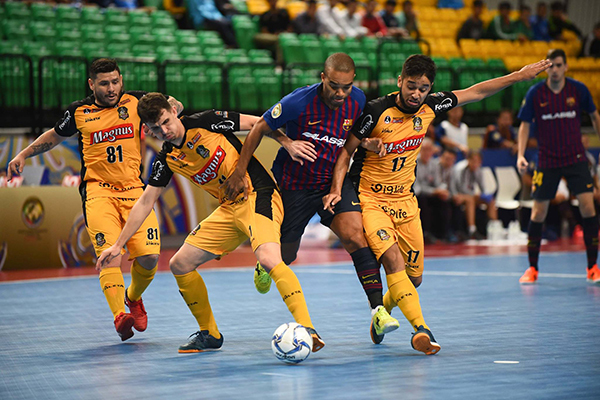 Barcelona had the chance to get their revenge on Brazil’s Magnus Futsal after their defeat on penalties in the last edition’s semi-finals. The contest was a tight affair from the beginning with it ebbing and flowing throughout. Both teams were very physical in defence with either sides’ main pivots, Ferrao and Eder Lima, facing the brunt of the strong challenges with the referees reluctant to intervene. Chances were limited but the best of the first half fell to Barca’s Ferrao who held off a challenge to gain space on the edge of the area but he was unable to add the finish. At half-time the scores remained 0-0. It looked like it would only be something very special or a loss of concentration that would break the deadlock. In the end it was a combination of both that resulted in the only goal of the game. Barcelona substituted their four players whilst Magnus had a kick-in on the halfway line. This allowed Lino to find Eder Lima alone on the edge of the area and he controlled the ball on his chest before acrobatically swivelling in the air to volley the ball into the back of the net. Barcelona tried to use the fly goalkeeper in the final few minutes to get the equaliser but failed to create anything of worth. 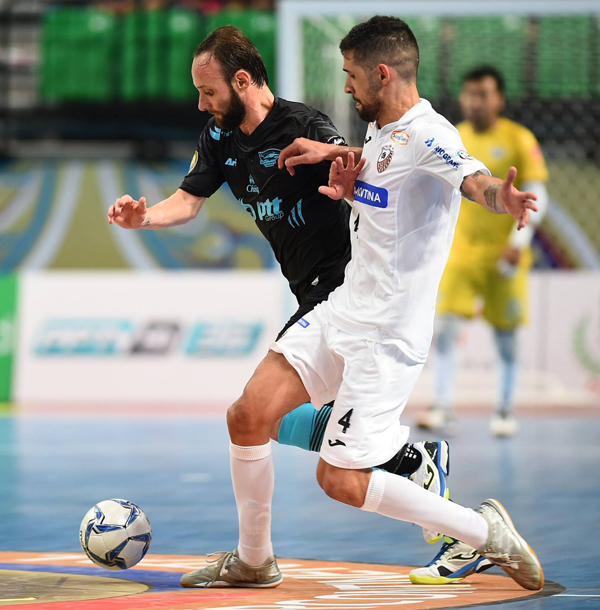 As a result of the first game, the following match in Group A between Chonburi Bluewave and Carlos Barbosa would decide who they would face in the semi-finals between Magnus Futsal and FC Barcelona. Neither an attractive proposition. Carlos Barbosa had the majority of possession as Chonburi set up their defence on the halfway line but the chances were shared between the two teams with the Thai’s Keko proving particularly dangerous. It looked like Carlos Barbosa’s forever young 39-year-old captain Valdin would get the first goal after he rounded the goalkeeper but the ball was cleared off the line. Instead it was his teammate Douglinhas who put them 1-0 up after Chonburi’s goalkeeper seemed to be caught in two minds as to whether he would shoot or pass to the far post. Valdin set up their second after stealing the ball on the wing and passing across the goal for Darlan to finish. In the second half Pesk added a third by finally finishing a ball that ricocheted around the penalty area. The fly goalkeeper hasn’t been successful for teams so far in the tournament but that wasn’t the case for Chonburi who got two goals in the last two minutes to get within one of an equaliser. However, it would prove too little, too late and it ended 3-2 to the South Americans. On Saturday the semi-finals will see Carlos Barbosa face FC Barcelona and Magnus Futsal playing Chonburi Bluewave for a place in the final. Before that, on Thursday, Africa’s representative Equatorial Guinea will take on their Central and North American counterparts Elite Futsal in the 5th/6th Place Playoff.